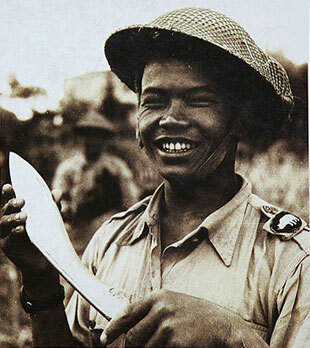 British Gurkha shows off his service kukri. As I have mentioned in other posts, not all of my martial studies interests fall within the domain of Chinese culture. The Himalayan kingdom of Nepal is also fascinating. It’s political, religious and military history is wonderful for a number of reasons. For such a small place they always manage to be in the thick of it when it comes to important events in world military history. About a decade ago I started to collect antique Nepalese military kukri. At the time there was less interest in these knives and it was possible to get better deals than what you often see on ebay now. Later a company named International Military Antiques (IMA) bought an ancient warehouse (or a modern archeological site—depending on your point of view) full of vintage 19th century weapons in Katmandu. While a momentous undertaking, they were able to transport these arms to the US where they are now sold to military collectors. After the fall of the Monarchy, the military’s sale of this old equipment (much of it was quite literally rotting in place) became public knowledge in Nepal. The kukri in particular (and any antique weapon in general) has a very special place in the Nepalese definition of identity and nationhood. The whole thing is very similar to the relationship between Japanese traditional culture and swords as an object of spiritual and artistic veneration. Needless to say the national media went into an uproar and politicians began to demand the return of their “national treasures.” I doubt that this will happen, but the whole incident has led to tighter export controls on antique arms and art. A antique kukri from the IMA cache. Mid 19th century. So, between that and the rising popularity of these knives as an ethnographic item I suspect that the “golden age” kukri collecting is probably over, at least for now. Increasingly collectors are turning to the study and reconstruction of Nepalese military culture as it applied to kukris, rather than just acquiring cheap antique blades on ebay. In that regard I have been very lucky. The majority of the antique military kukris (tens of thousands of them) that were taken out of Katmandu by IMA remained in the possession of an Indian multi-national corporation named Windlass Steelcraft. They shipped this material to Conyers Georgia where it is sold by their wholly own subsidiary Atlanta Cutlery. During the last few years I have been allowed to visit their warehouse to study their cache of 19th and 20th century kukris four times. That gave me the opportunity to study, measure, photograph and analyze literally thousands of examples. There are a many different sorts of kukris out there as lots of groups have used these knives for various reasons. And I don’t claim to be an expert on all kukris. But when it comes to Nepalese military blades I can safely say that I have examined and handled as many of these as anyone else in the west. My analysis on this subject can be found at Sword Forum International. I have made two contributions in the field of kukri collecting. While studying the almost archeologically excavated pile of knives that came out of Katmandu I was able to work out a rough time-line for when various styles of blades were first produced and how long they stayed in service (30-40 years doesn’t seem to have been uncommon). Secondly, building off of the work of other more experienced collectors I cracked the code that allowed us to read the (highly abbreviated) inscriptions that one often finds on the back of old military kukris from Nepal. Sadly even experienced military historians from Nepal had forgotten how to read these marks by the time IMA exported the equipment. The People of India : A series of photographic illustrations, with descriptive letterpress, of the races and tribes of Hindustan originally prepared under the authority of the government of India, and reproduced by J. Forbes Watson and John William Kaye between 1868 – 1875. Hat-tip Berkley IKRHS. Recently I acquired a new knife. I haven’t had a chance to clean it up yet so I don’t have a picture of it here. It was made at the Ishapore rifle factory in India in 1927 and was issued to Gurkha troops serving with the British military. It is a full tang model developed by the British during WWI which is generally designated the MKII. These inter-war knives are very rare. I had been looking for an Ishapore example for years. Looking over my new acquisition got me thinking about the British use of the kukri with their troops. Specifically, is there any reason that they (to this day) continue to issue the kukri, or is it simply an extended exercise in militarized orientalism? To really address this question we need to know a little bit about the history of the kukri. The oldest example of a Nepalese kukri held in Nepal (at the national museum) dates only to the 16th century. While inward curving blades were not that rare throughout the ancient world (being seen to varying degrees in Egypt, Greece, India and China) they don’t appear to have been all that widespread in Nepal prior to the end of the 18th century to a little later. Modern Nepal did not exist until 1768 when Prithvi Narayan Shah, ruler of the Gorkha Kingdom, conquered and united all of the other principalities within the boundaries of the modern state. During this war the Gorkhali employed what was to their enemy a “new” weapon, an inwardly curved knife with a blade about a foot in length (33 cm). Often this was a reserve weapon with the primary arms being a bow, spear or sword. Period sources and artwork suggest that the kukri was employed with a small buckler-type shield though these rarely survive and don’t play much of a role in modern Nepalese military culture. It is reported that the kukri’s shape made it an effective chopping weapon and difficult to parry. A rare, very large, Nepalese military kukri in the “budhume” style. This sidearm is longer and heavier than the preceding example and was probably issued in the opening years of the 20th century. While well into the era of the rifle the kukri was still considered to be an important sidearm. As the new regime consolidated its control and began to build something of a national identity the kukri was adopted as a key symbol of the new kingdom. It was even featured on some of the first postage stamps issued by the state. It was adopted as a side arm, a survival tool and a farm implement by the various ethnic and linguistic groups that made up Nepal. I have often suspected that the kukri spread as fast it did because of its extreme versatility. It was often carried with a small sharp companion blade, a steel that could be used to repair the edge of the main blade, a piece of flint and a pouch for tinder to start a fire. With this simple kit a traveler or soldier in the foothills of Nepal could build a shelter, chop wood, make a fire and protect himself from animals or other people. The traditional kukri might be the most brilliant camp tool/survival system ever invented. Add a canteen for carrying water and you are ready to go. So it makes sense then that the Nepalese military would adopt the kukri. They were an important nationalist symbol, and they were highly adapted to the environment that the military was expected to operate in. But the British? They were shipping Gurkha troops (who enlisted mostly because of the relatively high pay) off to the Middle East, Europe, India and China. Why would they continue to insist that every Gurkha (with a few exceptions) be issued with a kukri? A suspicious observer might note that the British were probably pretty interested in the kukri’s nationalist appeal. One might think that an imperialist power like the UK would be overly-wary of expressions of nationalism. Nevertheless, the situation with the UK seems to have been more complicated. Knowing that there simply were not enough Englishmen to actually occupy the Empire, the British became very adept at turning their colonial dependents against each other. This strategy allowed a relatively small number of British administrators to hold the balance of power in their hands. And not only did the local tribes not unite against the British, but they begged them for help in resolving conflicts that arose largely because of British policy in the region. 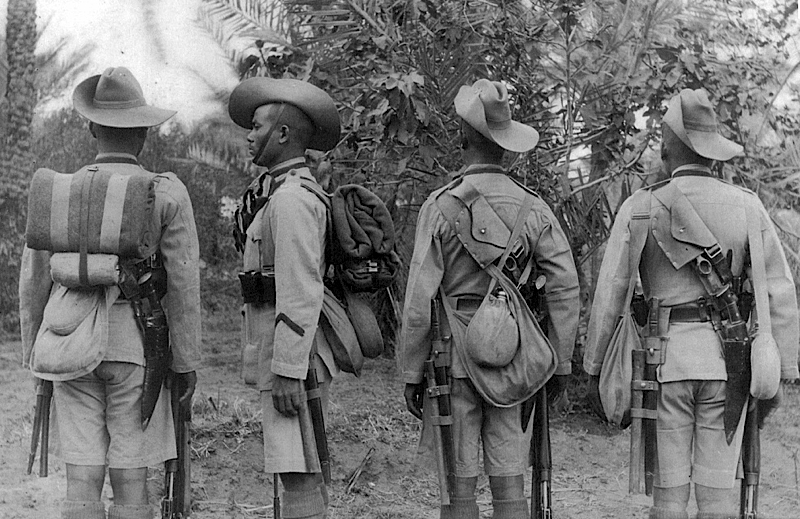 British Gurkha uniform and gear in modern-day Iraq, 1918. Note the riveted full tang kukri, unlike the more traditional glued short tang favored by the Nepalese military. 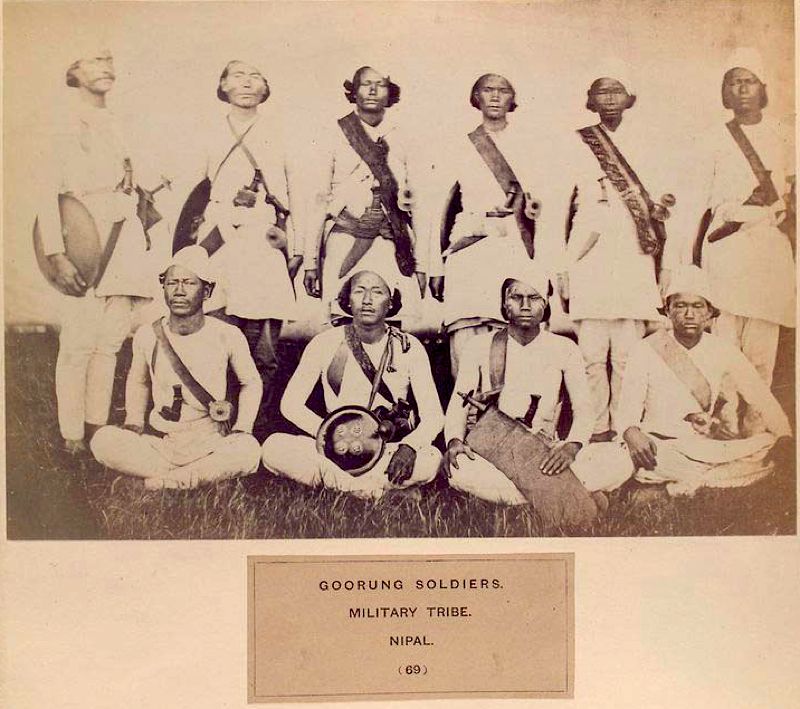 So maybe the Gurkha’s were given kukris precisely because it reminded them of their proud Nepalese military heritage. This symbol might also remind these troops that the Nepalese were the traditional enemies of the Chinese, Afghans, Tibetans, and the Indians…pretty much everyone that the British sought to control. Reinforcing this traditional nationalist identity might lower the chances that the Nepalese and the Indians might decide to make common cause against the British occupation of South Asia for instance. I don’t think we should dismiss the kukri’s value as a reminder of the Gurkha military heritage and national identity. But at the same time, there seems to be something more here. A good friend of mine was a military officer who had the misfortune to spend way too much time in Iraq a few years back. Because of where he was posted he had the opportunity to work with British troops and some Gurkha units. He told me that he was surprised to discover that in room clearing drills when a rifle jammed (not uncommon in the desert) these individuals were trained to switch to their kukris and continue fighting. American and regular British troops were taught to seek cover and attempt to clear the jam. One can only speculate as to how much solid cover there was in the average Iraqi living room. The Gurkha approach of pressing the attack seemed much more sensible to my friend. One wonders if the kukri persists into the modern age precisely because there is a need for a solid hand-to-hand combat tool in the modern military. Ever since WWI military planners have been moving in the other direction; it is clear that a lot more people get killed with missiles, bombs, artillery and explosives than anything else. But as much as we try to avoid it, sometimes you are forced to close with the enemy, whether its trench raids in France in WWI, the Rat-war of Stalingrad in WWII or going room to room through the home of suspected militant in Iraq and Afghanistan today. No matter how much we try to avoid it, a certain subset of soldiers keeps finding themselves engaged in hand-to-hand combat in practically every conflict. The fact that some missions call for you to capture rather than kill your enemy means that this reality is not likely to go away anytime soon. A 1917 dated MKII kukri issued to British Gurkha units. This particular example has seen a fair amount of use and the blade has been “blued.” World War One kukris are occasionally found with blued blades though it remains unclear when or why this finish was added. I don’t think the British are the only ones to have realized this. Modern western militaries have gotten very good at figuring out how to use entrenching tools as weapons and we still issue a variety of fighting knives. The Japanese assumed that the Gunto blades they issued to their field officers would be totally ceremonial, until actual conditions on the ground proved them sadly mistaken. They were forced to add saber training to the curriculum at the Toyama military school during WWII. Likewise both the Communist and Nationalist Chinese forces were issuing dadaos, or two handed military machetes, to their troops throughout WWII. The standard arms of a Chinese special-forces soldier (often referred to as a member of a “suicide squad”) was a fully automatic broom-handle Mauser carbine, a few grenades and a dadao. In fact, it was the success of these troops that forced the Japanese military to rethink the necessity of increased swordsmanship and hand-to-hand combat training for their own forces. 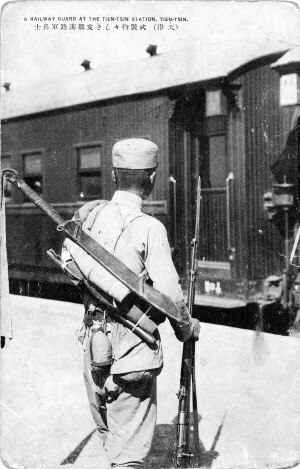 A vintage Chinese postcard showing a military guard at a train station. Notice that he carries both a modern rifle and a dadao (technically a “big knife” or sword) slung across his back. I suspect that if one really wanted to understand the logic of the British military kukri in the 20th century this is how the question needs to be framed. Rather than just seeing it as an exercise in orientalism, the kukri needs to be placed besides the other implements that states have adopted to solve the same set of basic questions. Compared to the dadao, katana, sharpened shovel, bayonet or combat knife, the kukri has a lot of advantages. It is relatively small, light-weight and versatile. It has never lost its ability to function as the ultimate survival kit. And even the relatively small and light versions issued to modern troops can be very effective in hand-to-hand combat. How effective you might ask? Just read this. Any questions? For my money the kukri is the greatest combat knife of the 20th century.